Our Goa trip was 'the' sun and sand party that it was meant to be. Of course considering the month we had gone in, the sun was a wee bit more than comfortable. But that did not stop us from having a good time. Though I cannot claim that we have eaten at all the places that be... I would say we have had a good taste of what Goa has to offer. Let me explain by way of taking you along to all the restaurants that we did visit. 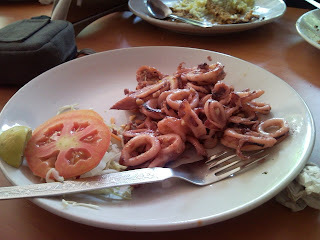 We were first taken by Uncle Desmond to this place called Florentino's, in Arpora. It is quite a nondescript place and is actually situated off a long winding road that seems to lead to nowhere. You take a right turn and then slam!!! you almost run the car up the restaurant's portico. The place looks like it has been set up in someone's front yard. A stone's throw away are homes of other families, many of whom will come out to ogle at you shamelessly. 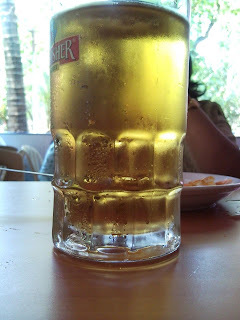 Of course day one in Goa and the first thing we ordered was cold beer. Long live KF!!!! With the thirst quenchers in place it was now time for the food. Amongst the starters we ordered, the masala coated fried prawms. These were coated in rava and fried crisp with the tails still on. Since they were steaming hot, they really were a treat. The next was a plate heaped with mussels/squid garlic fry. While Sudhakar did not really like this.. I completely loved the subtle flavouring of the garlic. This is by far the only restaurant in the whole of Goa that serves Goan food but does not serve pork. Though that was disappointing... it was more than compensated by the fact that we had excellent sea food and a good beer to wash it down. Another place worth mentioning is George or Georgies as it is called by the locals, near the famous Panjim church. We chanced on this place and it has some of 'THE' most tastiest goan pork sausage pulao ever. When the pulao first came it did not really look all that great. There was a mound of yellow rice that covered the entire base of sausages. But once you mix the two - heaven on earth. Sudhakar, who is more open to newer dishes decided to go in for a goan delicacy - the beef tongue roast. This dish came smelling delidecius (as anoushka would put it) and had the tongue sliced with a generous helping of sliced onions, capsicum and garlic. Sudhakar vouches for the fact that the dish was great. Another good restaurant was Hibiscus which is just past the bridge on the Baga road. This restaurant too was an experiment. It said Chinese food but the menu had Indian, Chinese and Italian. Thankfully we had enough of us to try out all cuisines. I must say that the pasta bolognaise I ordered was amongst the best of Italian pastas that I have had. The sauce was tangy, the meat chunky, the number of olives just right and the seasoning superb. Sudhakar opted for a pasta in white sauce which was equally good. My dad opted for his standard sweet and sour pork with mixed fried rice and noodles for mom.... The chinese food too was right on target. For desserts we had an assortment of fruit salads, cheesecakes and brownies... all of which I will definitely recommend.